Inicio/SpanishviaSkype, This is Spain/Special World Cup Promotion! Spaniards love fútbol (football/soccer), so we are pretty excited about World Cup Football in Brazil, that starts tomorrow and ends on July the 13th. SpanishviaSkype wants to celebrate it with lower prices on its Spanish classes on Skype with native teachers from Spain. ¡Aprovecha esta oferta y empieza a aprender español con nosotros! (Take advantage of this offer and start learning Spanish with us!). Spain will head to Brazil the defending World Cup champions for the first time in the Red Furry’s (La Furia Roja) storied history and with an excellent chance of keeping the World Cup trophy in Madrid’s hands. 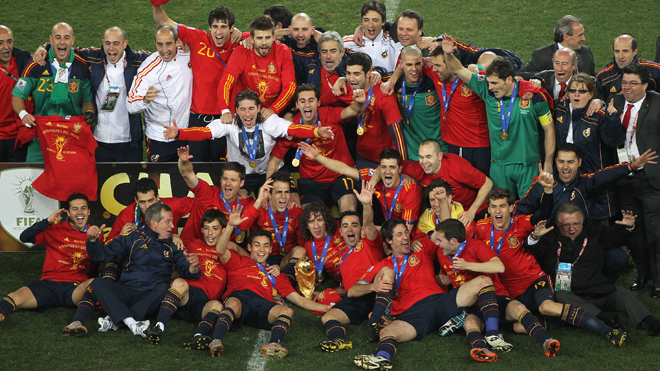 The Spanish soccer team reached the World Cup Champion in 2010 in South Africa and this year we’ll try to win it again! Take advantage of this promotion and start learning or improving your Spanish with us. It’s so much fun! Featuring a roster very reminiscent of their team in South Africa – Xavi, Sergio Ramos, Cesc Fàbregas, etc – the Spanish squad is made up almost exclusively of players from FC Barcelona, Real Madrid and the English Premier League, with a couple of Bayern Munich guys. Also returning is coach Vicente del Bosque, who under his tutelage has brought Spain’s dynamic tiki taka style to the highest levels of international soccer. During the Spain World Cup celebration the overall attitude in Spain was of pure euphoria after having finally delivered the results that many had been waiting for for 80 years. It was a day of the Spanish sport history, not only marking the first Spanish FIFA World Cup win but also the first time any European nation had won the tournament outside its home continent. Spaniards from all regions celebrated this victory together and showed the world their national pride. We were elated, having reached a climax in Spanish sports history. Email us to admin@spanishviaskype.com and we’ll explain to you how to book classes with us. It’s very easy! New student? Click here to ask for a free trial class (20 minutes). ¡¡NO DEJES ESCAPAR ESTA OFERTA! !